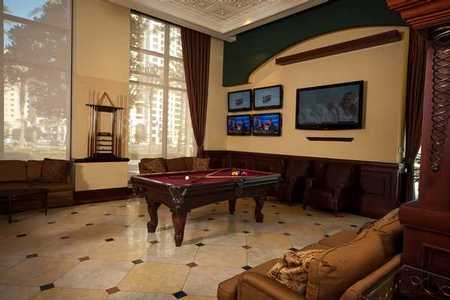 Steps away from the convention center; a stone’s throw from Seaport Village; and a San Diego minute from the Gaslamp Quarter is Redfield’s Sports Bar, in the Manchester Grand Hyatt Hotel. 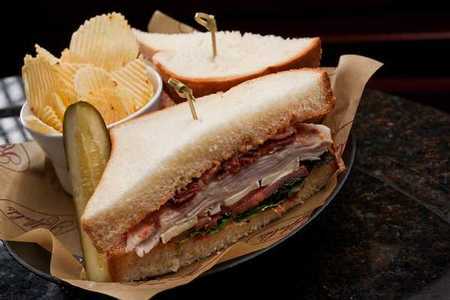 Redfield’s combines dining elegance and premium seasonal ingredients with delicious, classic sports bar dishes. 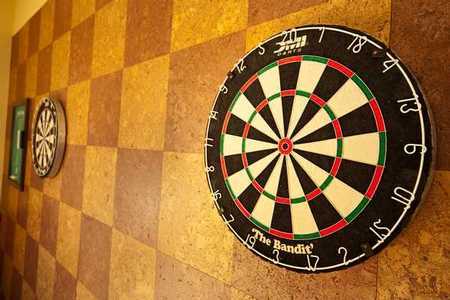 With twenty-one high definition TV’s showing every sporting event imaginable, a gigantic pool table, and a fully loaded bar, Redfield’s is the ideal destination for game night or after work. Redfield’s also boasts a daily eight hour happy hour, with drink and food specials that will have people wondering why they’re not regulars. 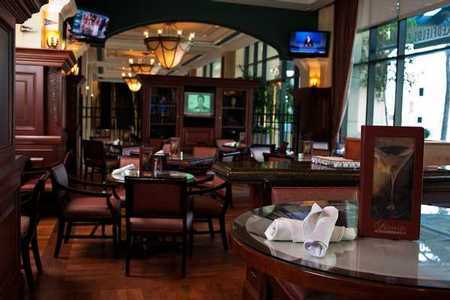 Enjoy a selection from Redfield’s cigar list on the patio or bring the family, Redfield’s has something for everyone. The Manchester Grand Hyatt sits in a prime location in Downtown San Diego. While discreetly separated from the popular Gaslamp District by Harbor Drive and a pair of trolley tracks, the hotel is located just steps from the San Diego Convention Center and the scenic Seaport Village sits right outside the rear entrance of the hotel. As if you still needed another reason to stay at this luxurious hotel, there is still one more enticing aspect: Redfield’s Sports Bar. When thinking of a sports bar, your thoughts might turn to loud yelling, small televisions, sticky floors, watered down beer, or bar nuts that have been handled by dozens of people. You will not find these unthinkable characteristics at Redfield’s, but what you will find is seventeen high definition flat screen televisions, showing every sports channel imaginable, a classy décor that somehow still manages to keep the sports minded theme in mind, and a menu that boasts a large selection of signature margaritas and mojitos, foreign, domestic, and microbrew beers, and a selection of fine wines. Redfield’s does have bar nuts at every table (and they’re quite good), but they pale in comparison to the astounding everyday menu. 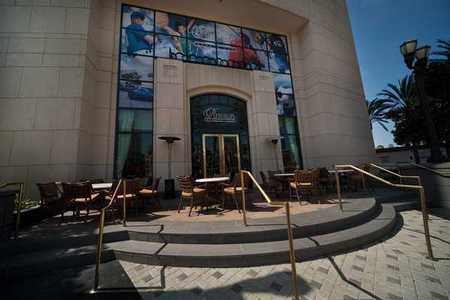 Located at the far south end of Downtown San Diego, The Manchester Grand Hyatt appears just that, grand. The large driveway leads up to a valet area located under an extensive awning, supported by large columns. Even though valet parking is only $3 for three hours with validation from the restaurant, I opted to park in the self-parking structure which was free for the first three hours with restaurant validation. 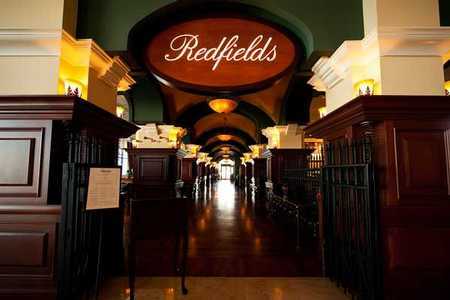 Redfield’s is located off to the far right of the hotel lobby, separated by a much lower ceiling and a large marble archway. It sits right next to a small coffee shop and is surrounded by cast iron fencing with a large red sign. Another sign located at the entrance, informed my dining companion and I that we were allowed to seat ourselves. One might expect sports memorabilia littering the walls or bright neon signs assaulting the eyes, but the restaurant is simply and elegantly decorated, with burgundy wood adorning the walls and tables and a ceiling painted a soothing forest green. As we sat ourselves upon plush raised chairs, we notice that the table tops are glass with professional sports photography underneath. The table looks so stylish, but is given a down-home feel by the traditional salt, pepper, ketchup, and hot sauce that adorn each table. This is the first of many instances where I noticed a balance between classy and casual that makes this restaurant unique. Soon our waitress, named Andrea, comes to take our drink order. With so many unique drink options to choose from, we ask her for her professional recommendation. She explains that the mojitos are very popular and recommends her personal favorite, the Orange Mojito. For my dining companion, Andrea recommends the house margarita and informs us that it is made with hand-muddled limes. 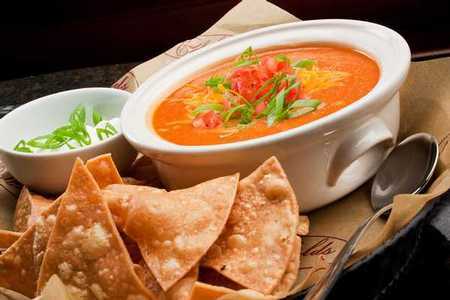 Our first dish arrives shortly after our drinks: A Spicy Tortilla Soup with a side of house made tortilla chips. The presentation is remarkable. The soup comes in a small cup on a pristine plate, next to a small bowl of sour cream. Seen floating atop the soup are a few shreds of cheese, diced tomatoes, and sliced green onions. The golden brown chips are scattered on the side, a few flecks of course salt glimmering in the light. As I take my first taste,, strings of cheese stretch from the bowl to my spoon. The flavor isn’t overly hot, probably because of the cheese and corn tortilla, but the flavor of the chilies does create a robust taste. I add a small dollop of sour cream, creating even more of a balance between the flavors of the chilies and tomatoes. I was told later that the soup also included a blend of onions, cumin, and cool mint, accounting for the bold flavor. Even though the soup contains a lot of tortilla flavor, the tortilla chips served on the side add a delicious textural contrast to the smooth soup. They’re crisp and crunchy with just the right amount of salt. It was a particularly chilly day that day, and this soup was the ideal way to warm up. Redfield’s offers this soup daily, as well as other specialty “soup of the day” options. Just as we were finishing our soup, our second dish arrived: A Chicken Ranch Wrap. 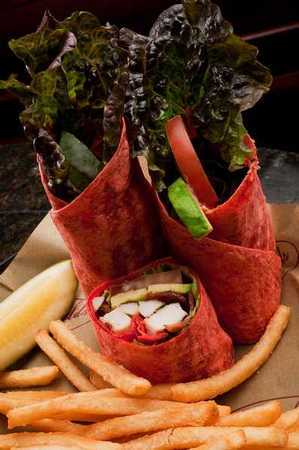 The wrap is cut into three pieces and served upturned on a white plate. 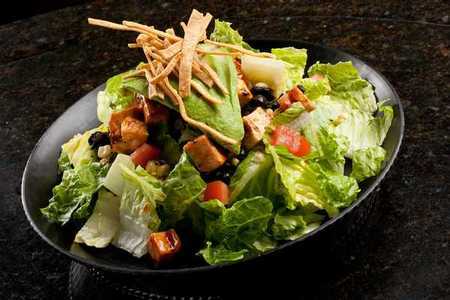 The dish consists of crisp bacon, fresh avocado, grilled chicken, tomatoes, lettuce, and house ranch dressing, all wrapped up in a red tortilla. The first thing I noticed is how flavorful the chicken was. Grilling it had certainly brought out all the flavor of this premium poultry. It was complimented nicely by the saltiness of the bacon and the sheer flavor of the avocado, while the lettuce and tomato added crispness to the wrap. Ultimately, what really tied the wrap together was the ranch dressing. It complemented all the other ingredients and really gave the wrap a subtle flavor. Accompanying the wrap was a side salad of mixed greens with sundried apricot dressing. The salad consists of mostly mustard greens and a micro greens mix, as well as my favorite salad vegetable, cucumber. The sun dried apricot dressing is delicate and sweet without taking away from essence of the salad greens. 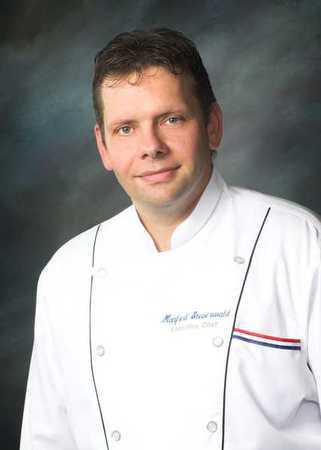 After the wrap is finished, I am served one of Redfield’s most popular appetizers, two rather large Prime Rib Sliders. 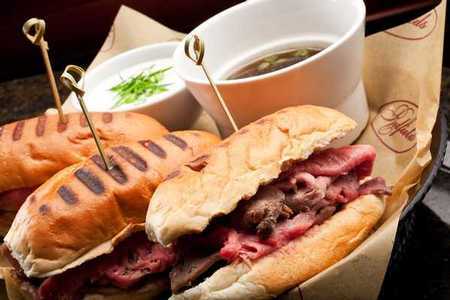 They are served with two large bowls of au jus, complete with green onions floating on top, and a side of creamy horseradish sauce. The presentation of this dish is different than our previous dishes in that the sliders are served on a raised plastic dish with wax-paper, like you would find in a deli. While this is quite a change from the immaculate white plates and the upscale décor, these plastic “basket dishes” add a very down-to-earth feel to the meal and furthers the wonderful balance of elegance and coziness that I mentioned earlier. The Prime Rib Sliders are really quite tasty. Redfield’s manages to toast just the very outside of the bread, leaving the insides soft and moist. Similarly, the premium prime rib is also tender and juicy. The meat is sliced very thin and marinated in au jus, making it succulent and soft. The bread and meat are so tender that they both melt together as soon as they touch my tongue. I also find myself very impressed by the creamy horseradish that comes on the side. Its consistency is that of fresh, creamy butter and differs from actual horseradish in that its flavor is much more subtle. The next dish continues the motif of tender, delicious, premium meats with a Reuben Panini on Rye, served with house made potato chips and a pickle spear. This dish actually has much in common with the Prime Rib Sliders, it is served on the same plastic dish and wax paper, the bread is toasted with the same precision, and the meat is so tender it practically dissolves in my mouth. The pastrami is cut extra thin and stacked extra high and while most pastrami is slightly tough and chewy, I easily bit through the many layers of meat much like a hot knife through butter. The Swiss cheese is thick and gooey, complementing the saltiness of the pastrami nicely. The salt of the pastrami is countered well with the sauerkraut and Thousand Island dressing, creating a slightly tangy taste that doesn’t overshadow the pastrami. The chips are very similar to the previously mentioned tortilla chips: Crisp, crunchy, and salty without being the slightest bit oily or greasy. The meal concludes with Redfield’s most popular dish, Redfield’s Chicken Wings. I am served both “naked” and breaded wings with three sauces: Thai Sesame Sauce, Hickory BBQ, and Flaming Hot. They are served alongside a bowl of house ranch dressing and blue cheese. First I sample a naked Thai Sesame Sauce wing, which has a surprising spicy kick in addition to a slight garlic and lemongrass taste. Even though the naked wings are not breaded, the outside is still fairly crispy and flavorful. As with the other dishes, the meat is cooked until tender and practically dripping off the bone. Next I sample a breaded Flaming Hot wing. At first I notice that the sauce has a nice blend of spicy and tangy, but the longer the sauce sits on my tongue the hotter it gets. The sauce is by no means too hot, but it definitely has a kick that won’t soon be forgotten. The breading around the wing is also tasty; flavorful without being too greasy or crunchy like some other wing batters. Lastly I sample a naked wing covered in Hickory BBQ sauce. I am struck by how sweet the sauce is, as well as its creamy texture. The sweetness of the sauce is offset by a slight vinegar tang, similar to the Flaming Hot sauce. By the end of the meal, I am extremely full and thoroughly satisfied. Redfield’s offers a wide selection of premium cigars to help end the meal. Although this unique option is incredibly tempting, I still have to decline. As my dining companion and I prepare to depart, we notice that the sun has begun to peek through the gray winter clouds outside of our window. By now there is a family friendly crowd gathering in Redfield’s, many of whom have come down from their rooms to watch one of the college bowl games. We bid our waitress Andrea farewell and take the short walk to our car. I’m so full I opt to skip the elevator and just climb the stairs. As I walk through the hotel’s lobby, I am reminded of the many places there are to visit and the many activities there are to do in this area of downtown, couple that with the great food at reasonable prices available at Redfield’s, I can certainly see myself returning here very soon. Do you allow the smoking of cigars in your restaurant? No, any cigars purchased at Redfield's must be smoked outside. Not available on UFC Fight Days. Our 23 oz spicy bloody mary is made with Absolut and Absolut Peppar Vodkas blended to perfection with creamy horseradish, worcestershire, Tabasco, pickle juice, fresh lime & tomato juices. Redfields is one of my favorite sports bars in downtown SD. They have over 30 high-def. flat screen TVs showing every game you could ever want! 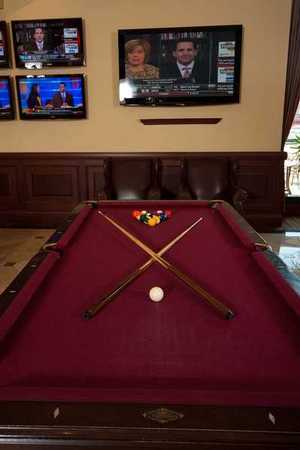 If you feel like partaking in a little competition of your own, they have darts and billiards. Last year during baseball season I would meet friends here before Padres games so we could have a few drinks and then walk straight to Petco Park. The food is great too! I personally recommend the prime rib sliders or the chicken wings (flaming hot, if you dare)!